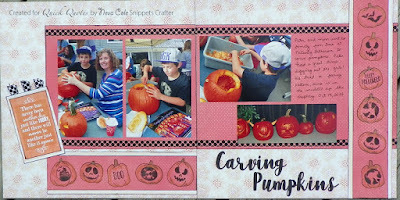 Blog Quick Quotes: Carving Pumpkins with Neva! Hello Quick Quotes friends! Neva here to share a memory from a few years back that features a few Halloween pumpkins! There are several collections that feature orange, which I thought would be a good backdrop for my layout. Two sheets of Secret Garden 104 with the orange flowered pattern is a great background. Two sheets of Navigator 100 are trimmed to 7 1/2" x 9" and 7 1/2" x 12" and inked with Powder Puff Chalking Ink in Coal Miner. The background is outlined with washi tape. The title is die cut from black cardstock. 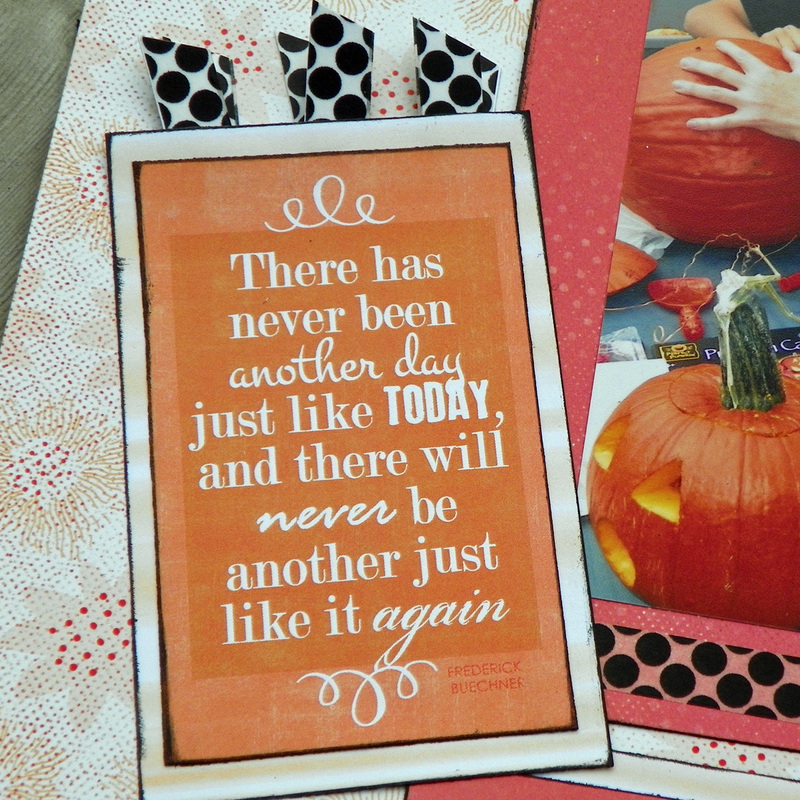 The two pumpkin borders are easily created using stamps and ink on Navigator 100. Two sections are trimmed to 9" x 2" and 2" x 12". The pumpkin images are first stamped in Coal Miner PowderPuff Chalk Ink. A brush tip applicator is used to color the pumpkins with Biscotti PowderPuff Chalk on the stems and Rusty Nail on the pumpkins. I like how this particular stamp set let me mix and match. Both sections are backed with Navigator 104 trimmed to 7" x 2 5/8" and 2 5/8" x 12". 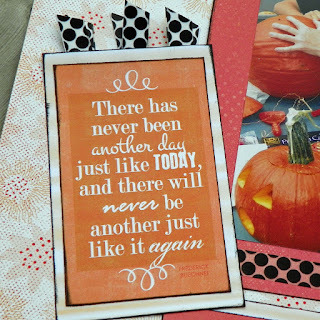 This quote from Farmhouse 500 is not only orange, but is also fun to use! The quote is trimmed, then inked with Coal Miner PowderPuff Chalk Ink. Navigator 104 backs the quote. Washi tape ribbons are created by layering washi tape on both sides of white cardstock. The "ribbons" are trimmed, folded, and adhered to the back of the sentiment. It was so much fun to relive these moments from a few years back. Thanks for joining us here at Quick Quotes!